It didn't take long for gaming sites to hunker down, gear up and start rolling out comparison articles of one of the hottest topics going on right now: Crytek downgrading Ryse to run at a stable 30 frames per second on the Xbox One. DualShockers did a comparison article with screenshots and a video showcasing what the major differences were between the two builds and measured a comparison between Ryse when it was running the lead character Marius at 150,000 triangles at E3, and the new version of the character running at only 85,000 triangles on the Xbox One. For those of you who don't know, Crytek's CEO Cevat Yerli tweeted about the downgrade, mentioning that they were cutting the character graphics in half for better shaders and fewer (or no) use of LOD (or level of detail) sampling for the main character. Now some fanboys might say that graphics don't matter, but when you have a title that's basically Quicktime Events: The Game, the only saving grace would be the graphics. In this case, the high-end display of visuals from those E3 gives us a very different kind of look from how the game will look on the Xbox One, where the graphics are expected and unspectacular. 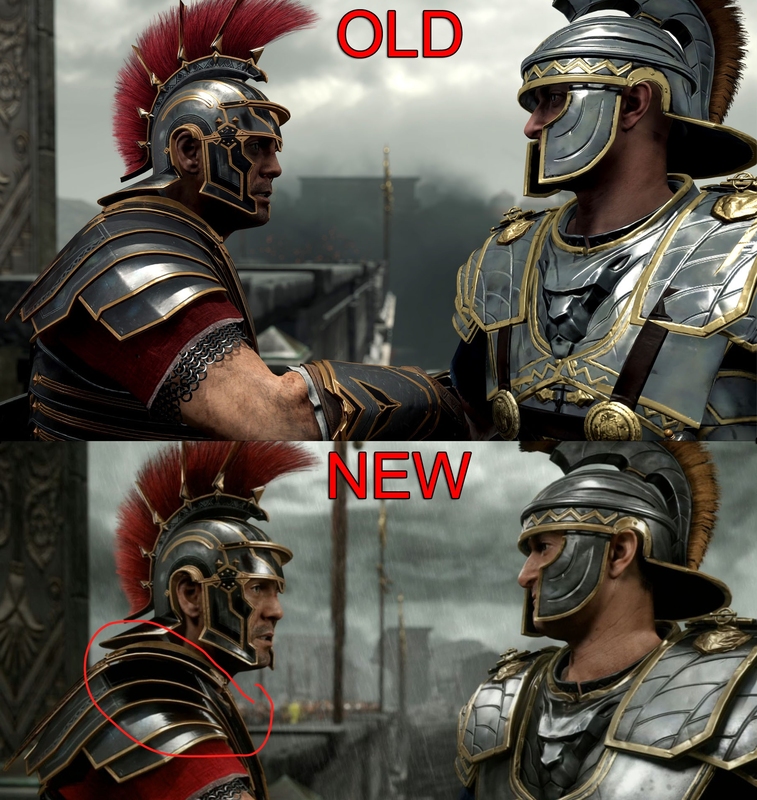 Crytek stated in the tweet that they fixed up the shaders for the game, but basically they just lightened the shadows so you can get a clearer look at the faces, and they dulled the look of the armor to give it a worn look as opposed to the cleaner, high-reflective sheen that was running on the machines at E3. There is, however, one slight upgrade noticeable in the change and it's that the texture resolution on the normal mapping has been slightly increased to make up for the lack of dark shadows around various areas of the character. Although, technically, under those lighting conditions it would seem like the shadows should be as dark as the "old" version given that it's quite dark outside and there's no source casting a light to brighten up the characters where they're standing. Other than the straps that are now obviously missing in the new version of the game for the character on the right, notice how the shadows change with the character on the left... there's a huge, huge thing that changes on his armor... did you spot it? I'll give you a hint: pre-baked shadows. It's tough to tell if they're just textured onto his armor or if there's a condition to add or remove them under certain lighting environments, but in the new image at the bottom, the scaled plates have an obvious gradient shadow casting that shouldn't be there. They're quite dark and it looks like it could be textured onto his armor, as opposed to actually casting and reflecting compared to the old build where you can see that each reflective light pass is being rendered. Now some of you might say “But, but, but it's the teh new shaders!” no, it's not the new shaders. The new shaders are lighter, and eases up on the darkened boxed shadow effects, as you can see with the soft shadows on the character's skin. Technically, if the shadows weren't baked onto his armor then they should have been lighter, like the rest of the shadows in that scene, since there's nothing over that area of the shoulder scales to cast a shadow dark enough on that section of the armor. What does this tell us? It tells us that the E3 version of Ryse was just an all around bigger, badder, game. More polygons, higher resolution, stable framerate, more reflections, reflective surfaces and light passes. It's good DualShockers rolled out this comparison because it shows just how far along Crytek had to take steps back to get this game running stable on the actual Xbox One hardware.